Soul Food for the Hungry Adult: New Year’s Day, January 1, 2013. 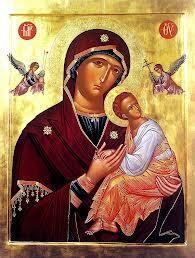 January 1st, 2013: Feast of Mary, Mother of God. And then from the Gospel for this feast of Mary (Luke 2:16-21): ‘As for Mary, she treasured all these thing and pondered them in her heart.‘ Early on in the history of the Church, from the 4th century, she was eventually proclaimed truly Mother of Jesus, the Redeemer and Son of God, and given the title ‘Theotokos’, meaning Mother of God. And today we celebrate her, Mother of Jesus and Mother of who are the Body of Christ. We call her OUR LADY! ← Wholly Family!- The Holy Family. Sunday December 30, 2012.